“I got balls and guts,” Gary Stevens tweeted on the evening of Feb. 23. 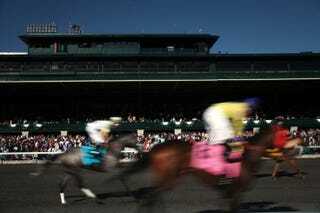 The barb was directed at an armchair critic who blasted the legendary jockey's ride in that day's Risen Star Stakes — at the Fair Grounds Race Course & Slots, in New Orleans. Stevens’ mount, Proud Strike, finished eighth in the race, and some fans in the blogosphere blamed the rider. Stevens felt compelled to respond directly to one of the more vocal detractors. Few would argue with Gary Stevens’ declaration. He has competed in more than 27,000 Thoroughbred races worldwide over a 34- year span, winning more than 5,000 and frequently putting himself in danger in the process. Over the years, he’s often tried to squeeze his horse through a tight opening, or pin a rival down on the inside — whatever it takes to win. Oh, yes. Gary Stevens has guts and balls. He has ‘em to spare. He’s also got an intense desire to show the world that he’s got them. And should you challenge him, as the Twitter pundit did, he's going to want to fight you. Then go over to Time's Lightbox site and dig this photo gallery by Jehad Nga. And as Barry Petchesky reminded us the other day, it's always fun to revisit Hunter S. Thompson's memorable trip to the Kentucky Derby.